People like to feel in control. They like to feel able to take charge of shaping their future lives. Sometimes they can experience difficulties, however, if they feel things are beyond their control. People know they can only do their best, of course, and there are events they can’t control. But they can choose their attitude regarding how they respond to such events. 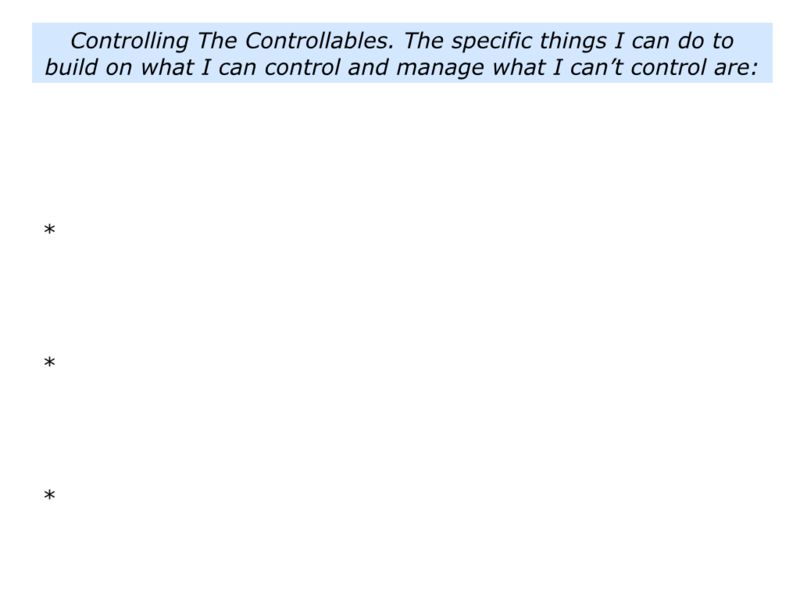 If you wish, try tackling the exercise on this theme of control. 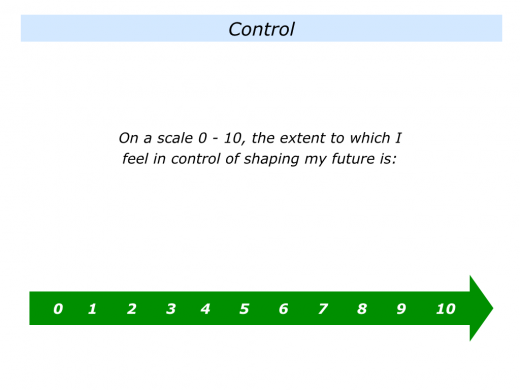 On a scale 0 – 10, to what extent do you feel in control of shaping your future? If appropriate, what can you do to maintain or improve the score? Several years ago I worked with Laura – not her real name – who gave herself a low score when doing this exercise. “Right now I would give myself 3/10,” she said. “That is unusual, because normally it would be at least 8/10. “I am an organised person and pride myself in being able to deal with problems. That is what I do in my work, where I manage the accounts of several difficult customers. “My father died recently, however, and since then I have been having panic attacks. I have been to the doctor, who ran some tests. He says there is no medical reason for the attacks. “My father and I were close and his death was unexpected. Since then I have taken care of everything – the funeral, my mother, relatives, solicitors, everything. This is normally the case in the family and at work. “But now I don’t take care of myself. Suddenly I get panic attacks in the street or at work and it is embarrassing. Laura recognised she may not be able to control her mood swings, as these were part of grieving. She wanted to take control of her behaviour, however, rather than succumb to panic attacks. Trying to fight the feelings did not work, so we took another approach. Did she know when the attacks were going to happen? What were the warning signs? Laura described the sequence. She felt tired through lack of sleep, often after spending hours counselling other people in her extended family. She felt a tingling sensation in her hands, which then crept up her body. She felt detached and began to feel dizzy. She had difficulty breathing and started to sweat. She wanted to escape from the situation and, if possible, find a place to be quiet. She managed to recover after 10 minutes and was able to resume whatever she had been doing before the attack. Looking at this sequence, we saw that Laura could intervene at the first warning sign, the tingling sensation in her hands. Looking back on her life, when had Laura managed similar challenges successfully? What had she done right then to create a sense of calm? How could she follow these principles – plus maybe add other skills – in the future? Laura and I explored a version of the following exercise. 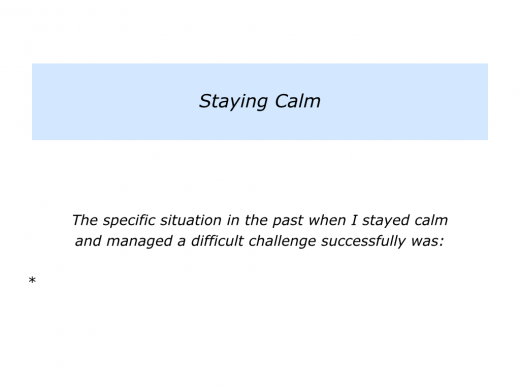 This invites a person to recall their successful patterns for staying calm and managing difficult challenges. “I used to compete as a high jumper,” said Laura. “During the events I used to put on my headphones and play soothing music. This also helped me to breathe more deeply. How could she follow similar strategies in her daily life? Laura could certainly put on her iPod and play music when travelling to work on the tube. This would help her to feel calmer, but it would be more difficult at work. “Breathing is probably the key,” said Laura. Laura also planned to take more care of her physical and psychological health. This called for getting more sleep, eating properly and returning to daily exercise. She aimed to spend more time with her encouragers, rather than only counsel other people. 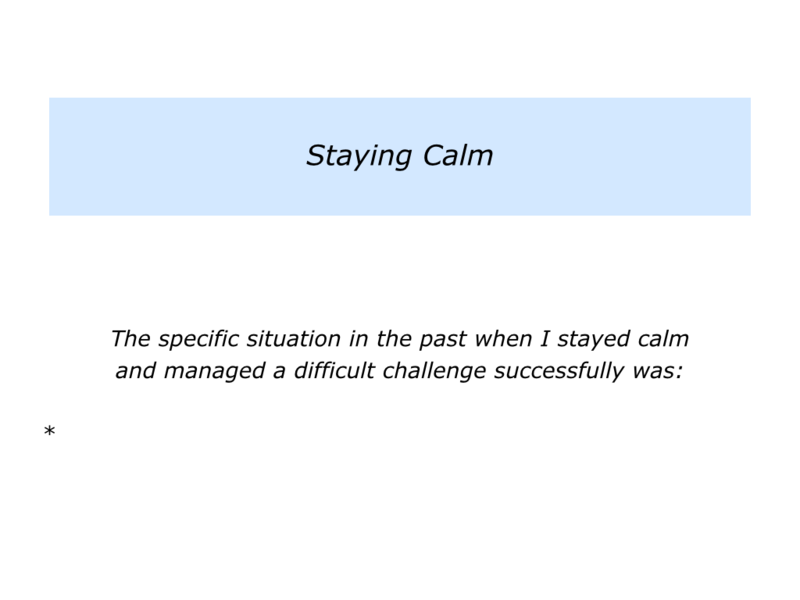 Two months later she reported that, whilst experiencing some mood swings, there were no panic attics. Laura felt more in control of being able to shape her future life. Positive people focus on what they can do. They build on what they can control, rather than worry about what they can’t control. 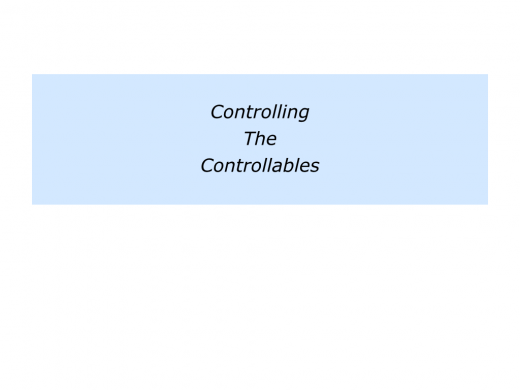 If you wish, try tackling the well-known exercise on this theme called Controlling The Controllables. This invites you to do the following things. “I can control my attitude, my professionalism and always doing my best at work. “I can control my diet – the food I put into my body – and my exercise. Exercising is difficult in the winter, but I can go running on the weekends. “I can’t control other people’s opinions of me. I can’t control my employers, the job market or the government’s policies. “At work I can spend more time doing what I do best. This means working on the kinds of projects I find satisfying. “It is unlikely that my employer will give me these opportunities, so I need to create these myself. I also need to show how doing these projects will bring commercial benefits to the company. “There are quite a few things I can do about my health. The first step will be to book an annual health check. “I used to do this regularly, because it was a service provided by my previous employer. But it is now time to monitor my health. You will have your own approach to controlling the controllables. If you wish, try tackling the following exercise. Human beings want to feel they can shape their futures. 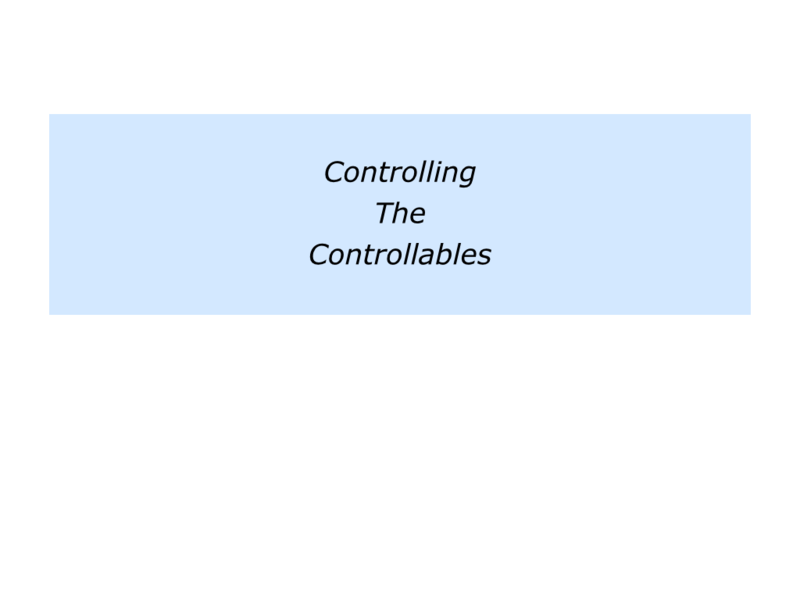 Control sometimes gets a bad press, of course, but that is often because it is interpreted as wanting to control others. Peak performers focus on how they can improve their own efforts. Imagine you are a sprinter who aims to compete in the 100 metres final in the Olympics. You can control how you make the best use of your talents. You can control your preparation and training. You can control your attitude – such as whether you have positive or negative self-talk. You can control your concentration during competitions. You cannot control the other athletes, the weather or the crowd. If you wish, try tackling the final exercise on this theme. 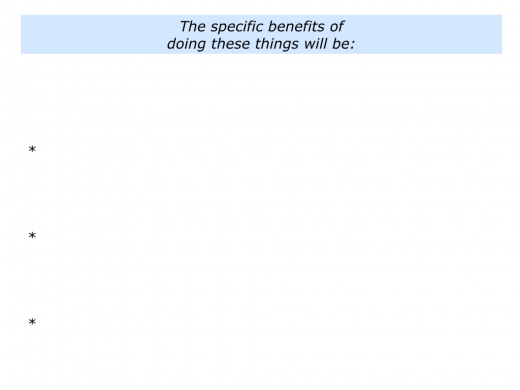 Looking at your own life and work, this invites you to do the following things. Describe, on a scale 0 – 10, the extent to which you feel in control of shaping your future. This also includes your ability to choose your attitude towards events that do occur. Describe the specific things you can do to, if you wish, maintain or improve the rating.